Contrary to predictions that had favored the SPD, the CDU/CSU under the leadership of Konrad Adenauer emerged victorious in the first Bundestag elections on August 14, 1949. 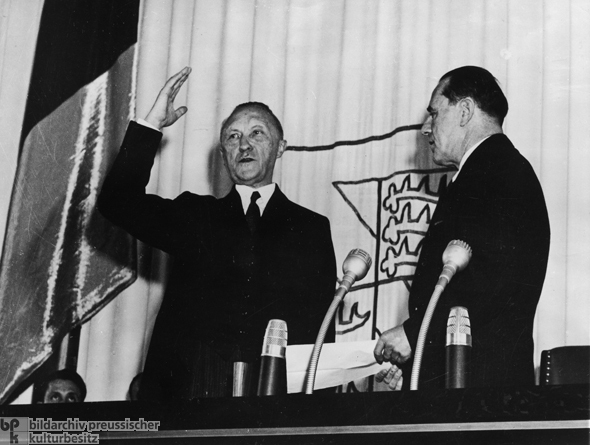 Adenauer thereupon formed a coalition with the FDP and the German Party (DP). On September 15, 1949, the Bundestag elected him as the first chancellor of the Federal Republic. That same day, Bundestag president Erich Köhler (right) swore him in on the constitution. Photographer unknown.